Recent Arrival! 2019 Chevrolet Blazer Day Centennial Chevrolet on Route 51 in Uniontown, PA treats the needs of each individual customer with paramount concern. We know that you have high expectations, and as a car dealer we enjoy the challenge of meeting and exceeding those standards each and every time. Day Certified Pre-Owned means you not only get the PEACE OF MIND and assurance that comes with a Powertrain Limited Warranty, but also a 100-point inspection/reconditioning by a CERTIFIED and factory trained technician, 24/7 roadside assistance, and a complete CARFAX vehicle history report. At Centennial Chevrolet, our entire team works together to provide you with the ultimate Chevrolet shopping experience. We are here to exceed your expectations, deliver the best service possible, and make car shopping fun again. If we can be of any assistance while visiting us online, send us an email and we will promptly reply. We hope to see you soon! We're Gonna Make Your Day! (724) 438-2577. 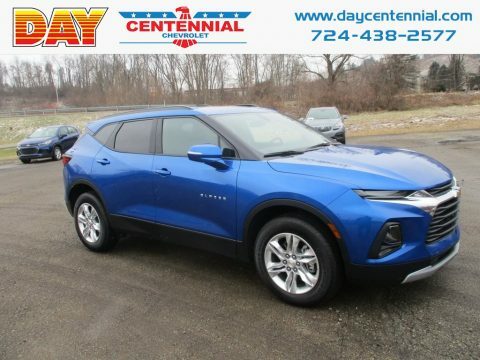 Factory MSRP: $36,735 Blue Metallic 3.6L V6 SIDI DOHC VVT 9-Speed Automatic FWD 2019 Chevrolet Blazer Day Centennial Chevrolet on Route 51 in Uniontown, PA treats the needs of each individual customer with paramount concern. We know that you have high expectations, and as a car dealer we enjoy the challenge of meeting and exceeding those standards each and every time. Day Certified Pre-Owned means you not only get the PEACE OF MIND and assurance that comes with a Powertrain Limited Warranty, but also a 100-point inspection/reconditioning by a CERTIFIED and factory trained technician, 24/7 roadside assistance, and a complete CARFAX vehicle history report. At Centennial Chevrolet, our entire team works together to provide you with the ultimate Chevrolet shopping experience. We are here to exceed your expectations, deliver the best service possible, and make car shopping fun again. If we can be of any assistance while visiting us online, send us an email and we will promptly reply. We hope to see you soon! We're Gonna Make Your Day! (724) 438-2577. Factory MSRP: $36,735 Blue Metallic 3.6L V6 SIDI DOHC VVT 9-Speed Automatic FWD 20/26 City/Highway MPG Plus tax, title & license. Doc fee of $141.00 not included in price. On Approved Credit.